Arrive Lhasa by train from China side or fly from Kathmandu. Welcome by our Tibetan Guide at train station or Lhasa Airport. Transfer to hotel, free afternoon for acclimatization. Sightseeing tour of Potala palace , Jokhang temple, Bharkhor traditional market and visit Sera monastery. Guided tour of Sera and Drepung monastery . Drive to airport or train station for your onward journey. 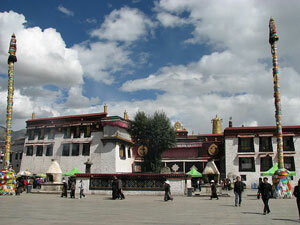 Lhasa / Tibet short tour combined with Kathmandu sightseeing tour. Day 3 Fly Kathmandu to Lhasa Gongkar airport ; drive to Lhasa (1.5 hrs ). Day 5 Guided sightseeing of the Potala & Norbu Lingka. 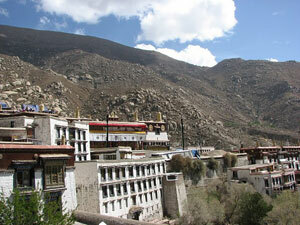 Day 6 Guided sightseeing tour of Drepung monastery, Tibetan Hospital and Nunnery. Tibet visa cost : USD 114 for Europeans, USD 198 for USA passport holders . This one hour flight between Lhasa to Kathmandu is one of the most expensive in the world. Roughly USD 400 for one way and USD 800 for return , at present . Air China frequently increases/ decreases its flight costs, please confirm with us for the current flight cost before booking the trip. Nepal reentry visa fee, tips , personal nature expenses . If you have one extra day, you can visit the spectacular Yamdrok Tso lake on the Lhasa Gyantse highway ( from the Kamba la pass ) or visit the Ganden Monastery which is 40 km away from Lhasa . 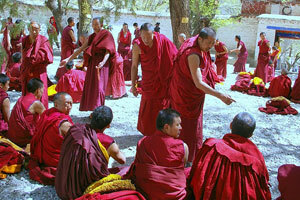 Ganden is the first Gelugpa monastery and has a fantastic atmosphere . Norbulinka palace can also be included in this visit . Those having two days’ time can even visit Namtso lake which lies some 170 km away from Lhasa .